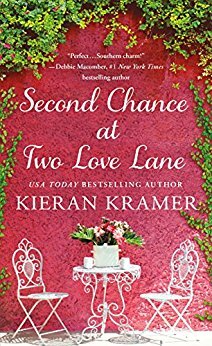 The last book in the Two Love Lane series from Kramer gives readers a sweet wrap up. Ella is the last lady from Two Love Lane in need of a true love of her own. But, what if she already had hers? That’s what Ella believes. She experienced love at an early age, right after college. Then her boyfriend left her to pursue his career, while Ella went a different path. Without that breakup she wouldn’t be who she is now, wouldn’t have Two Love Lane. So, when that love from her past is suddenly back in her life it’s not a sign of potential, it’s a chance for her to prove she’s moved on. This sweet heroine is probably one of the nicest people I’ve ever met, at least the nicest book character. She’s kind, considerate, cares about her clients, friends, and family, and is scared to put her heart back in the hands of the guy who broke it. I would be too. Add in a family scandal, a supporting role assignment in a big screen movie with an A list actress, and a client who’s cursed. This sounds like the beginnings of a wild tale… and it was. Did I mention the ex has become a big-screen movie star? Yep, dear hero, Hank, is on his way to being named Sexiest Man Alive. But, recently he’s come to realize that all this money and fame he’s acquired really means nothing. He’s wandering aimlessly in a sea of accomplishment and wants more from life. So why not try to win the girl back? The one he’s always loved. Too bad everything is trying to keep them apart or—is it trying put them together? Kramer gives a sweet story with lots of side-roads. There’s plenty of humor, heartwarming moments, and a good healthy reminder to never give up on love. I thoroughly enjoyed the characters, though do believe readers will be more invested if they’ve read the other books in the Two Love Lane series. My challenge with this story is that the conflict levels weren’t even on medium levels. I have been in a mood lately where I enjoy stories light on the angst. External conflict is not the main driver in this story, nor do the hero and heroine have a big-time villain/antagonist. Though, I would have liked a little more drive to keeping them apart, another hurdle. This is a personal opinion, of course. Overall, if you’re looking for a feel-good read with second chance romance, with an extra smattering of love this might be the book for you. I enjoyed it; I had read the others in the series.